What Does Code P0121 Mean? 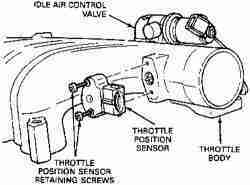 The throttle position sensor (TPS) is located on the throttle body. It is a type of variable resistor which changes its resistance value according to throttle position. As the throttle is opened, the voltage reading goes up. This information is used by the PCM to determine output controls such as fuel injection and idle air control. Most throttle position sensors are simple and easy to troubleshoot. There are three wires attached to the TPS: power, ground and signal. Power, or reference voltage, goes into the TPS. The sensor then sends a return signal voltage to the PCM. The return voltage depends on throttle positon. Typically, the signal value at idle will be about .45 volts. This voltage reading increases as the throttle is opened and will read about 4.5 volts at wide open throttle (WOT). Many late model vehicles don’t use a throttle wire. Instead, they use what is referred to as “drive by wire”. In these systems, a motor is used to operate the throttle using inputs from position sensors on the accelerator pedal. When the gas pedal is depressed, the control module commands the throttle to open. Then, a pair of TPS sensors relay the throttle positon to the control module so it knows everything is working properly. What are the common causes of code P0121 ? What are the symptoms of code P0121 ? Symptoms consistent with a faulty throttle position sensor include: hesitation or stumbling upon acceleration, unstable idle, and an illuminated check engine light. In some cases, a no-start condition may even result. How do you troubleshoot code P0121 ? Start with a visual inspection of the sensor and its wiring. Make sure the connector is plugged in and free of corrosion; and check for broken wires. Check the throttle body assembly for binding and signs of contaminant buildup. If the throttle body is visibly dirty, remove it and clean it with throttle body cleaner. This is readily available at any auto parts store. Once you have cleaned the throttle body, re-install it and clear the codes. If they don’t come back, your problem is solved. If the visual inspection doesn’t reveal anything obvious, it’s time to move on to testing the sensor. This can easily be done using a digital multimeter set to the volts setting. Start by consulting the repair information for your vehicle to determine which wire is the signal wire. Leave the connector attached and insert one back probe test lead into the signal wire pin of the connector, and attach the other to ground. Open the throttle slowly; you should see the voltage increase smoothly as the throttle is opened. Consult the repair information for your vehicle to determine what the exact TPS readings should be. Typically, the sensor should read around 4.5 volts at wide open throttle and .45 volts with the throttle at the idle position. You can also test the TPS with a scan tool. Connect the scan tool to the diagnostic port, and scroll through the PID list until you find the TPS voltage or position PID. Slowly depress the gas pedal; you should see the TPS PID value increase. No change indicates there is no input from the sensor. More than 5% at idle or less than 90% at WOT indicates a potential problem with the sensor as well. Unfortunately, most scan tools and multimeters do not have a quick enough refresh rate to catch a momentary glitch in TPS operation. That’s why the best way to test the sensor is with an oscilloscope. With the scope, you can view the voltage signal as a wave form. This enables you to spot any fleeting problems. If the TPS checks out OK, but you still have P0121 code illuminated, you’ll need to check the sensor circuit. First, you want to disconnect the sensor connector and test for power and ground. You can do this using a digital multimeter. Start by consulting the repair information for your vehicle to determine which pin on the connector is power and which is ground. Next, set your multimeter to the volts setting. Touching the black multimeter lead to ground and the other to the power feed on the connector, you should see a reading that’s close to battery voltage. If not, you have a problem with the sensor power supply. You’ll need to consult the power side of the wiring diagram to find where the circuit fault lies. If everything is OK up to this point, you’ll want to check the TPS signal wiring to the PCM. Using a digital multimeter set to the ohms, connect one side of the meter to the harness side of the TPS connector and the other to the TPS input pin on the PCM. This tests for continuity between the sensor and PCM. If your meter reads OL, there is an open somewhere in the circuit that must be repaired. If not, the PCM is likely the problem and should be replaced. However, PCMs rarely go bad, so make sure you double check all of your work before condemning the PCM. 2000 Impala P0122 code, how do I remedy this? Le cambie la garganta de mi vw beetle 99 y me presenta este código, es necesario hacerle ajuste básico? Y ya lo pudiste resolver? i have replaced my throttle position sensor and my pedal position sensor. i cleared the code p0121 after replacing them drove my truck down the road and check engine light came back on! what should i do?